Open Glider adds a hang glider to Minecraft, allowing you to soar through the skies and explore your world's beauty. A fluid flight motion and naturally immersive controls. A novel system of wind that you must combat to stay on course while in flight. The ability to deploy the glider and have it visually appear, both in first person and in third person view, as well as to other players if you are playing on a server. Aesthetically pleasing models and item sprites that change based on deployment. It is specifically coded to be efficient and computer friendly. Extremely configurable so that it can suit any playstyle. Wind, damage, distance traveled, visual effects, and the nuances of those are all configurable, and can even be easily done in-game via the mod options config GUI. Open Glider is the spiritual successor to Open Blocks' hang glider. Open Glider, however, has been rewritten, rebalanced, and refined for MC 1.10+. In addition, there have been some notable changes to make this mod fit alongside Vanilla's Elytra. Most notably this is handled by wind, a concept explained more in detail in the section below. For now simply know that great care has been taken to ensure that the hang glider still has a place in the game without overshadowing Vanilla mechanics. Open Glider aims to provide an earlier game alternative of imperfect, scenic flight to contrast with the elytra's nature of a fast and agile end-game flight method. Next, you simply right click the hang glider item to deploy it. You will know it is deployed as the item will change to resemble bars, and the glider will be visible on your back in third-person mode or above your head in first-person perspective. Note: First person handlebar rendering is temporarily disabled due to some visual bugs (it plays the re-equip animation every time it takes damage), but you can modify the config if you want it back immediately. You can press shift and will increase your speed to fly faster, but note that this does come at the small cost of not quite as much overall distance traveled. Now simply jump and glide away into the sunset! The elytra is a nimble thing, able to propel the player. 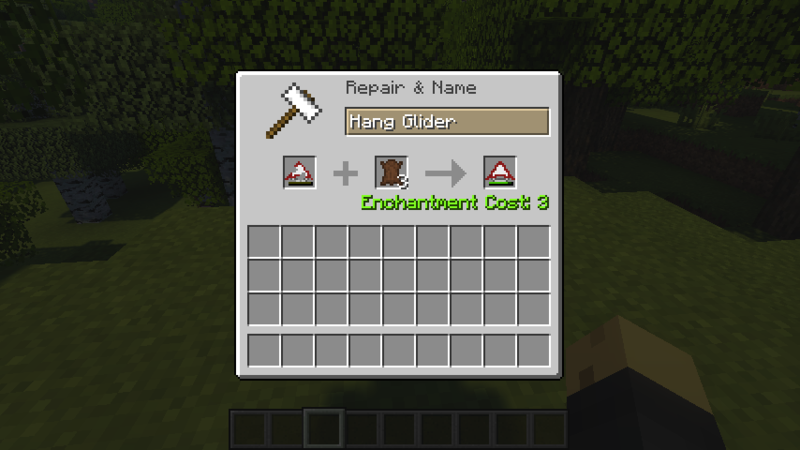 The hang glider is much larger, and therefore catches drafts of wind that the elytra does not. Unlike the elytra, the hang glider will deviate from its course, as wind may knock the player to the side. Generally wind comes in gusts, and there are pockets of windy areas compared to sections of calm air. A prudent flyer will constantly correct his/her flight as they travel so as to stay on course. By traveling quickly, the relative power of a sideways gust of wind is lessened due to havign so much forward momentum. Storms have been known to cause huge gusts; players must be more vigilant if they wish to fly during a storm. The more damaged the hang glider is, the more vulnerable it is to wind. Of course, all of this is configurable. The hang glider is damaged whenever it is used. Eventually, it will break and must be repaired in an anvil by using leather, similar to the elytra. For those of you who like the mechanics of flight as provided by this mod, there is now a late game option as well. 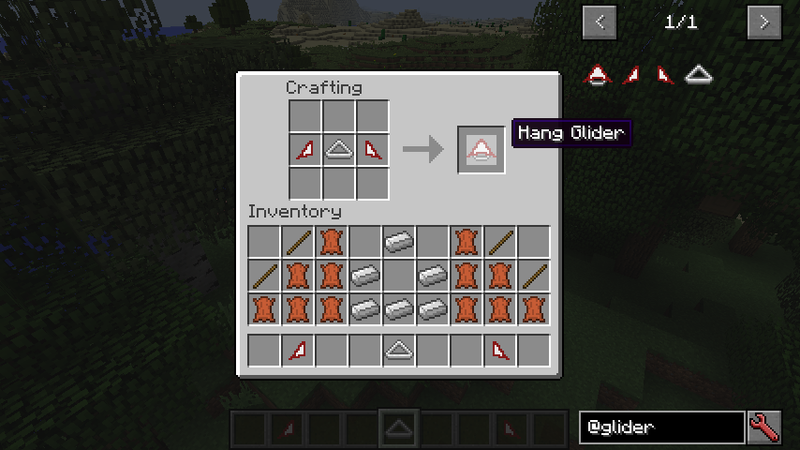 The advanced hang glider's crafting recipe contains an elytra (forcing you to choose between flight preferences, albeit temporarily) and is much faster, wind resistant, and durable than the normal variant. Note that this mod currently doesn't work perfectly with shaders; the first person rendering is broken. However, you can easily disable the first person hang glider rendering entirely via the in-game mod config options GUI. The changelogs[1.10][1.11] can also be found there. What works best for me is either through the messaging system here on CurseForge, or on esper.net IRC on channel #gr8pefish, or on the typical modded MC Discord channels (e.g. MMD, FTB, etc.). Are there wind currents like hot\cold ascending\descending currents to allow a longer flight like for real gliders? I read somewhere that one of the player models (either Steve or Alex) makes it so it doesn't render properly. A good portion of the Minecraft community uses the new model. Including myself and it has been out for quite some time now. Please don't disregard it as a small issue especially considering it's probably an easy fix! Using OpenGlider-1.12.1-1.1.0, MC 1.12.2, Forge b2654, Dynamic Surrondings, no Optifine. Your mod is beautiful, elegant, and fits very well with vanilla but also in general with low-mid tech mods. It certainly has made my experience in minecraft much better, and traveling is more fun. Congratulations! Some mods add additional dimensions. I suppose some of them (in theory, or fantasy) may have different air resistance or gravity. Or maybe flight could be impossible (for example a dimension without air). Do you have a suggestion for a user who intends to mix a mod like that with yours? Is it better not to bother, or could there be a way for the "config" of flight behavior to change depending of the dimension? Can you disable durability? It's my biggest issue with eletryas. Going to use this in a mod pack I'm making, really enjoy this mod! Would the 1.12.1 version work for 1.12.2? I believe so, but have no way to check myself (as I'm traveling). You should try it out and let me know if it works! I freaking love this mod! It provides an early game alternative to the elytra and makes traveling around anywhere much less tiresome. I have 2 requests though. The first is the ability to move the hang glider vertically as well as the current horizontal movement. This would provide much greater freedom of movement and would also provide a way of avoiding trees (goddamn things that are absolutely fundamental for minecraft survival! xD). The second request is for a much wider variety of minecraft versions. This is because there are mods that are discontinued (treecapitator is one example) and are therefore stuck on older minecraft versions. I know porting to a different minecraft version is extremely tiresome and annoying AF because I have done some basic modding before and I decided to upgrade from 1.7.10 to 1.8... worst choice of my life. I don't think I'll make much vertical movement, as I want to differentiate it from the flight pattern of the elytra. That being said, I may still consider it. Sorry, I'm not porting this to previous versions. You can use Open Blocks' glider if you need it. Internally this mod uses a system that only came about in 1.10+, so a backport would be a lot of work with minimal gain, and I frankly don't have any time/interest in that. Please, let me know what they are. Post in the issue tracker (link in the main post above) and I'd be happy to address them! Need to get this to 1.11.2 Its a great way to explore the world before you get into the end to search for elytra. Loved it in 1.10 would really like to update to my 1.11.2 world.